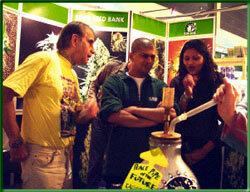 and taking a hit from Bill’s vaporizer at the Marijuana Museum in amsterdam. 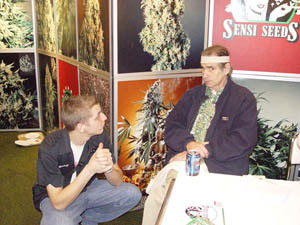 Eagle Bill at the Sensi Seeds booth during High Times Cannabis Cup (Pax) in 2003. 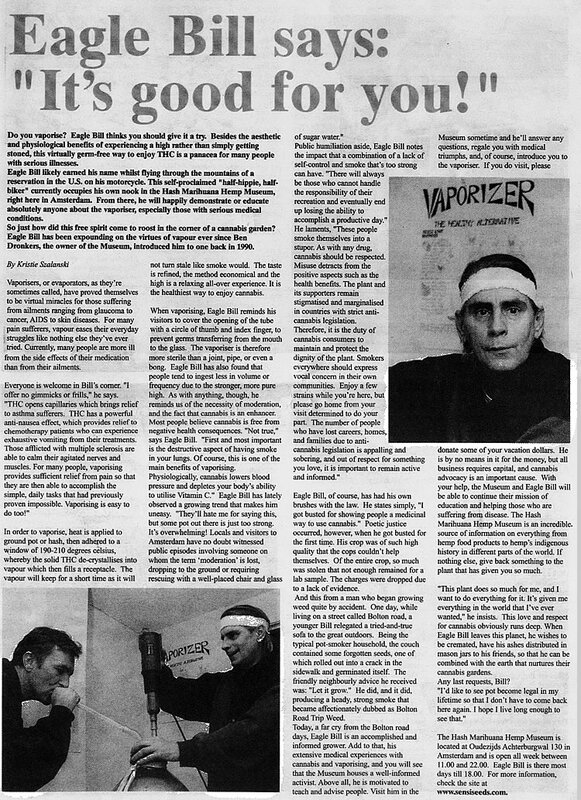 (This is an article from the Dutch leading daily ‘de Volkskrant’ from friday April 5th 1996). A vaporisor, a big one, a with water filled jampot and two glass-blown pipes; Eagle Bill’s vaporiser is not a very beautiful invention. 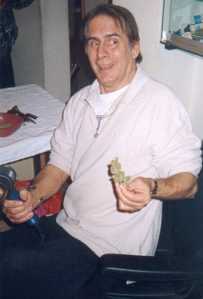 But it works, according to users, ‘super high’, without pulmonary affections, perfectly for medically use of cannabis. Eagle Bill is a half Indian of 53 years young, raised in the Smokey Mountains. 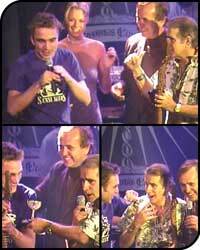 He likes to call himself ‘medicine man of the West’. For fifteen years he worked very hard at his invention. 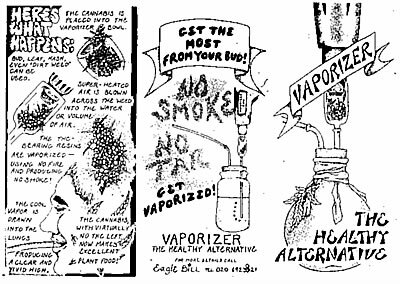 And like all big inventions, the solution, a vaporizer was a real simple one. Since then he walks through land and city with his vaporizer. But his aim of life, to make the world healthy with cannabis, still doesn’t get the honor that it deserves, according to Bill. He’s a little bit disappointed about that. 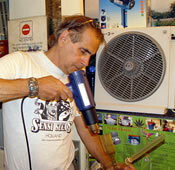 Different from a normal waterpipe, in the vaporizer, the marijuana doesn’t combust. The vaporizer heats the weed till exactly 210 degrees(c). That’s 20 degrees below combusting- temperature. Exposed to this heat, the volatile oil from the hash-glands of the plant evaporates. That’s how the active elements come free in cold air, and can be breathed moleculai rely by the user. 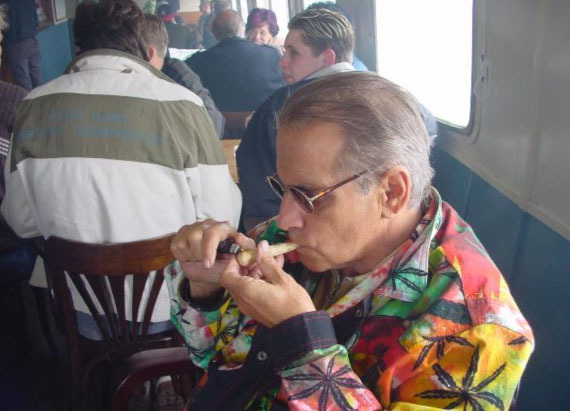 “The healthy way to experience cannabis”, according to Bill. 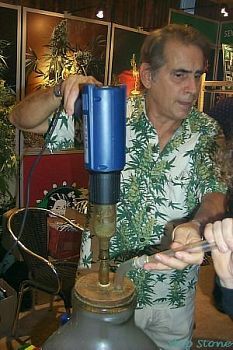 On Friday-afternoons, Bill is demonstrating his vaporizer in the Drugs Peace House, a place where you can meet other canna bists in the Amsterdam Spuistraat. 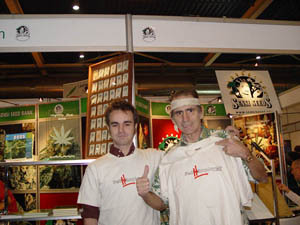 Bill was renamed in a ‘cannabis-sjaman’, and officially ‘in charge of promoting medical aspects of cannabis’. The admission in his own circles is very big. The appearance of Eagle Bill looks a bit like a male-witch. He drags himself along with a two meter long walking-stick with Indian carvings. In his other hand his inseparable suitcase with jampots, in which several sorts of cannabis are being kept. And not any of that genetical manipulated lamps-weed from Dutch making. 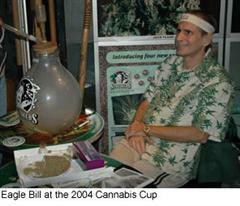 Bill only uses fair sorts of weed, exotic and sun-ripped. Name a disease, and Eagle Bill knows a sort of weed to enlighten it. Against depressions for an instance, he recommends Kaliganga, an energetic Jamaican weed which stimulates the fantasies. Headaches he controls with a Mexican variant, a far relaxed ‘upperdy-up weedy’!. 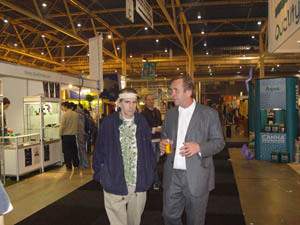 Users in the Drugs Peace House are really enthusiast, and nearly never sick anymore. 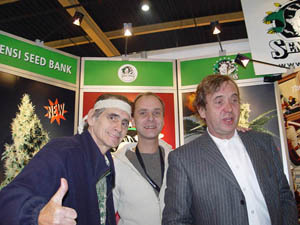 J. Offeciers says to go really “van de plank” from the vaporizer. Others honored the purity of taste, in which you would taste how fresh cannabis can be. “The bouquet!”, one distracted American shouts out surprised. Cannabis is being used as an anti-vomiting remedy for patients who undergo chemotherapy or use breakers for aids, as a hunger-stimulator against anorexia, and as a muscle-relaxant for MS and green cataract. Fear for addiction to the euphoria keeps many doctors from accepting the advantages of cannabis. Peer Neeleman, pain-attender in the Rotterdam Dijkzigthospital, is waiting with tension for a vaporizer with which exact doses of cannabinol can be administered. Then the ethical commission of the hospital will give permission for a serious investigation. A vaporizer from the alternative circuit, he doesn’t trust. “It is nice for a party”. Moreover, the vaporiser is too heavy for a MS-patient. Until there is developed a tractable apparatus, with which you can decide the doses, Neeleman is trying to do his work with weed-wraped tea. At home with the patients of course, because in the hospital it’s not allowed. In the mean time, Eagle Bill continues his mission. He is still looking for patients, so that he can prove that his method really works. Volunteers can enter one’s name to the Drugs Peace House. After placing this article, patients searched for contact with Eagle Bill. 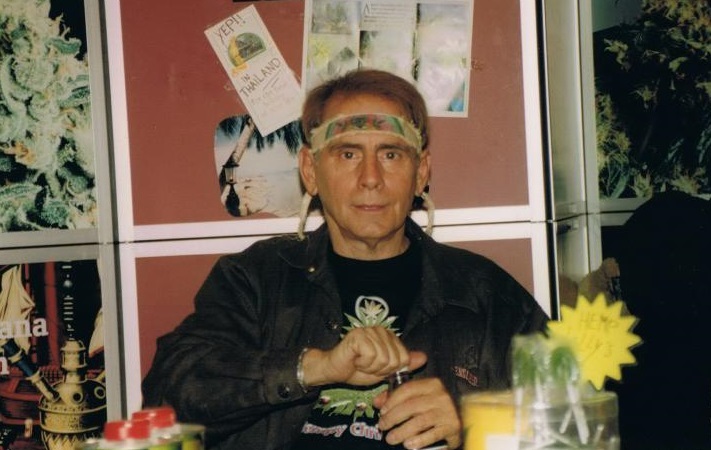 From this contacts it is evident, that the dosage of cannabis can be decided so exactly that the patient doesn’t get high, though can be helped for example with raising queasiness after chemotherapy. More patients with more different affections can give a more complete vision of the possibility for using cannabis this way.